that required music to be played. She is preceded in death by her parents, daughter Marilyn, siblings Duane, Ottmar, Floyd, Clarice, Beatrice, Dorothy, and Connie. 2018 when they moved to the Cornell Care Center. department. 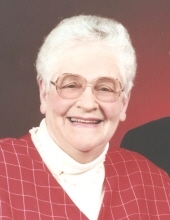 Knitting, sewing, reading and working crossword puzzles were her favorite hobbies. home. "Memories keep a song in your heart" so many memories and so many songs. Their funeral services will be held together at 11:00 A.M. on Saturday, March 2nd, 2019 at Our Savior’s Lutheran Church in Cornell, WI. with Pastor Andy Schottelkorb officiating. Interment will follow service at the Cornell Cemetery. Visitation will be from 9:30 A.M. until the time of service on Saturday at the church. To send flowers or a remembrance gift to the family of Carol M. Helgerson, please visit our Tribute Store. "Email Address" would like to share the life celebration of Carol M. Helgerson. Click on the "link" to go to share a favorite memory or leave a condolence message for the family.